An amazing finishing polish that removes fine swirls, oxidation, holograms, etc. Works great as a one step polish, or after correcting paint imperfections with more aggressive polishes. Absolute must have light polish for soft paints! Very easy to work with and works fast! 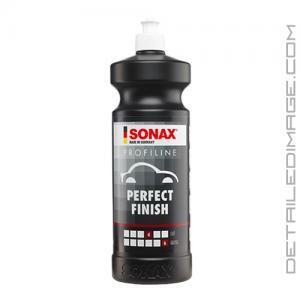 Sonax Profiline Perfect Finish is truly the perfect finishing polish! This outstanding polish was designed to finish down your paint, removing haze and leaving behind an ultra smooth finish at the microscopic level. You can use this product after more aggressive polishing to help remove any surface haze, light imperfections, etc. You can even use Perfect Finish as a great one step polish! It will provide enough correction to remove light to medium imperfections, a level of finish that puts it in elite company, and doing all of this in an amazing amount of time. Perfect Finish can achieve a high level of correction in as little as an hour and a half! Simply apply with a buffer and a finishing pad (ie Lake Country Black Finishing Pad) if you are using it as a finishing polish, or a polishing pad (ie Lake Country White Polishing Pad) if you are using it as a one step polish. One of the primary advantages of this product is how it finishes down so well even on those soft and finicky paints, that can be challenging to work on. Perfect Finish is an absolute must have product for these soft finishes so you can get perfection in a very short amount of time. Perfect Finish has a thicker consistency and it has the tendency to saturate pads more frequently than other polishes. For the best results be sure to change your pads frequently, 3 to 4 pads per car is a good rule of thumb for absolute maximum results. 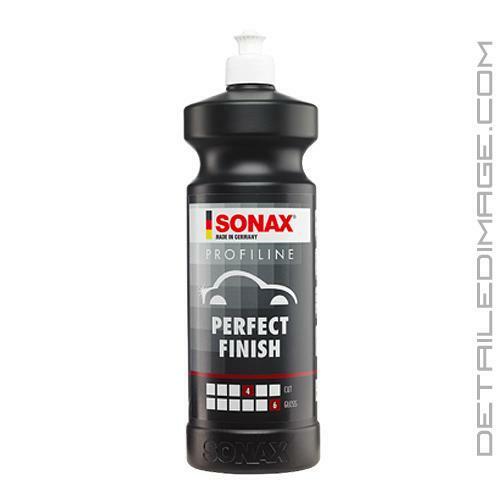 If you are looking for a great finishing, or one step polish that will leave your paint crystal clear, the SONAX Profiline Perfect Finish is for you! What makes Sonax Perfect Finish such a stand out compared to other polishes. The cut, finish, and ease of use just to name a few. On softer paints you can get correction that previously you would need to have performed at least a two step correction process. The key here is correction and finish. PF will finish down really well, as well as a dedicated finishing polish. Innovative paintwork finishing polish provides an initial deep cut, then diminishes to a gloss, resulting in a hologram-free paint surface. Desired results can be achieved in a single step. Silicone-free formula is an excellent choice for paint & body shops. If necessary, wet sand with P2000 sand paper, then wipe clean. Apply polish onto each sanded area. Polish on for 10 seconds at a low rotating speed with a SONAX Polishing Pad Orange (493 000), tilting the machine slightly. Exerting no pressure, finish polish for 20 seconds holding the sponge level. It's one of the best polishes out there..it has the perfect amount of cut to get that shine back and prep it for coatings. 5 stars. By far, the best one step polish I've ever used, wow, is all I can say. It's very easy to apply and remove with a microfiber towel as I used this product by hand. Powerful single step correction and polish product. I tried it out on a panel with a large scuff/scratch (approx 8" and just barely catches a fingernail). I used a MF Adam's pad on my 7424xp and it disappeared after 2 passes, first on 3 and second on 5. Time to buy a larger bottle.